Vaughan Public Libraries Teen Vortex » Week of Geek: Form Vortex Post! Week of Geek: Form Vortex Post! So let me tell you about my latest discovered fandom. I am way late to the party on this one, but who cares? I found it eventually. I kept seeing it in places like Tumblr, Pinterest and my usual nerdy online hang outs. And then a few nights ago, on a whim, I decided to watch the first episode, just to see what the fuss was about. I finished the first season last night. Holy heck, it was SO GOOD! So what is it? Voltron: Legendary Defender! Some of you may be asking What the heck is that? Bit of a story there. You see, back in the 1980s (yup, we’re going there again; it’s all the rage these days), what some television studios liked to do was to take Japanese anime and heavily edit it to make it an almost entirely new show on the cheap to sell toys. Cynical? Maybe. Do people still have fond memories? Totally. As this article details, that was the same for Voltron. It took the anime Beast King GoLion and tweaked it, though not by a whole lot. The first series made for North American audiences was Lion Force Voltron or Voltron: Defender of the Universe. It featured five pilots of space ships shaped like lions that could combine into a giant robot named Voltron. That was another thing that was huge back then: giant robots. (See: Transformers) These five pilots used Voltron at the behest of Princess Allura to battle the evil King Zarkon, his minions and his own giant ‘ro-beasts’. Admittedly I don’t recall watching this when I was a kid but it had, and has, a pretty passionate fanbase. Fast forward 30-odd years, past a few other versions of the show, to now and to Netflix. Voltron: Legendary Defender tells a similar story but with updated characters and animation. 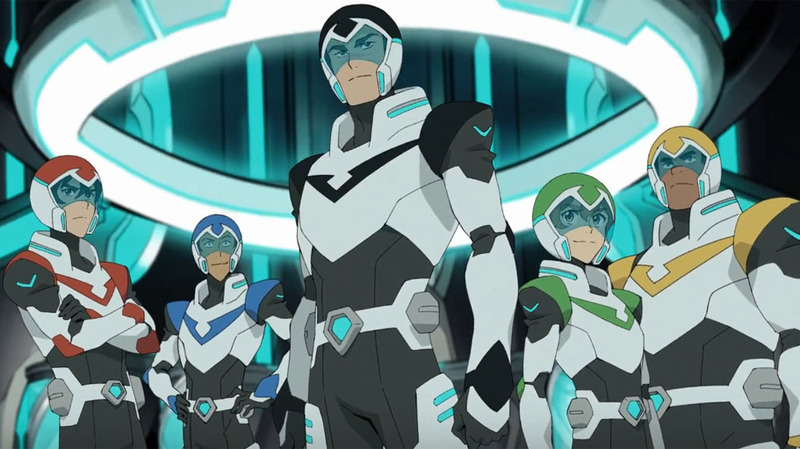 Five humans – Shiro, Keith, Lance, Pidge and Hunk – get swept up in galactic intrigue when they end up becoming the new paladins for Voltron, meaning they fly the lions and form the giant robot. They’ve been recruited by Princess Allura and her majordomo Coran to fight against Emperor Zarkon and his Galra Empire that’s conquered most of the galaxy (think the Empire from Star Wars and all the bad that comes with it, except the Galra have had thousands of years to get it right). The paladins each have their own unique personalities, hang ups, goals and strengths, and they must learn to work and fight together if they’re going to save the galaxy. The animation style of Legendary Defender harkens back to shows like Avatar: The Last Airbender and The Legend of Korra; shows that were produced in the United States but have very clear Anime influences. No surprise for the comparisons; Legendary Defender‘s showrunners worked on both Airbender and Korra. Similar characteristics exist in each show, such as a good mix of humor and drama, exaggerated facial expressions and some pretty epic action scenes. It’s colorful, it’s funny, it’s inclusive, it’s compelling, it’s gorgeous. I recommend it, and I’m definitely not the only one. So if you don’t have Netflix, how to get in on this? The first 2 seasons have just been released on DVD, so we’ll look into getting it into our collection, but in the meantime we have the graphic novel series on Hoopla and we have some of the episodes in book form. Anyone else seen it and would recommend it? Any naysayers? Post away in the comments or over on Write It. Have a good week Geeklings. Keep your eyes peeled for news about this September’s Fan Con, and until next time, End of Line.